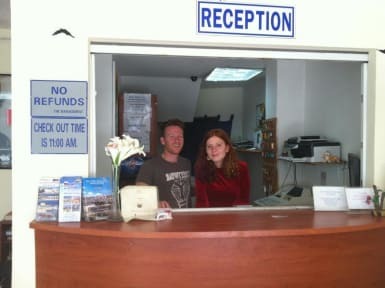 Our hostel offers dormitories with up to 6 beds and private rooms, double, twin and single. Rooms with a private bathroom or shared showers, rooms with fans or air conditioner. For those who wish to cook for themselves, we have a small kitchen with a fridge and a microwave. The hostel also has an Internet station. safes & lockers in the dormitories and a luggage storage is available for guests who checked out. 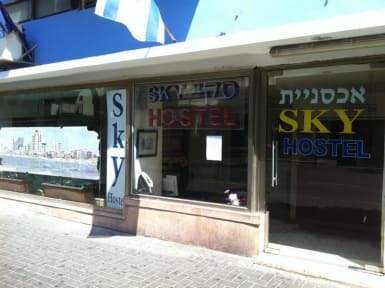 Next to the Beachfront on Yehuda Street, the location of this hostel is it's main advantage. The neighborhood is vibrant at night, especially near Bograshov st. where you can eat one of the best Hummus and mezzes in town. The staff were brilliant. The location was perfect. The room was a tip and poorly maintained - the picture on their brochure card is a LIE. I did not know the room was not air conditioned before booking. There were not clean sheets ready when I got there, the room, floors and shower were dirty. The bed had not been stripped. There was no holder for the shower head so it just sprayed everywhere and you couldn't use hands to shower. Don't let the pictures fool you, this place is absolutely disgusting. My girlfriend and I almost requested a refund but decided we would just stay one night after traveling 14 hours. The location is fine, but the rooms are moist and gross. I've stayed in hostels all across 3rd world countries in south America and Asia and Sky Hostel was worse than all of them. Look elsewhere, this place is a dump. I only stayed there because Abraham’s was full for a night. When I told people I was staying at Sky, they laughed in my face and now I know why. Everything about this place is old and rundown. It smells like feet and smoke. The only thing that’s nice about Sky is the convenience of being near the beach. Don’t stay here. This is hands down the worst hostel I’ve ever been to. Arrived at 1:30 am ready to sleep, when I found dead cockroaches underneath the pillow and live ones crawling around the room. The curtains were disgusting, the room faced a busy street and was extremely loud, and the room shared a wall with the bathroom so you can imagine how dirty it was. When I went to ask for a refund, they refused. Terrible experience - DO NOT STAY HERE!!! This hostel is very outdated. The "mattress" was questionable. They only give a piece of a thin sheet as linen. On the beds were old blankets. The facilities were horrible. The spray on the shower head was weak. Everything felt dirty. We only stayed 1 night because we needed to go to the Embassy the next day. We should have spent more and booked somewhere else. Don't stay here!!! I’ve stayed in a lot of hostels over the years but this one was truly the worst. Our room was dirty and moldy. Beds very uncomfortable. Air conditioning didn’t work and the bathroom was dirty as well and had horrible water pressure. The WiFi only works in the lobby and frankly we paid way too much money to stay there for one night. Staff wasn’t very pleasant or helpful. Skip this place!